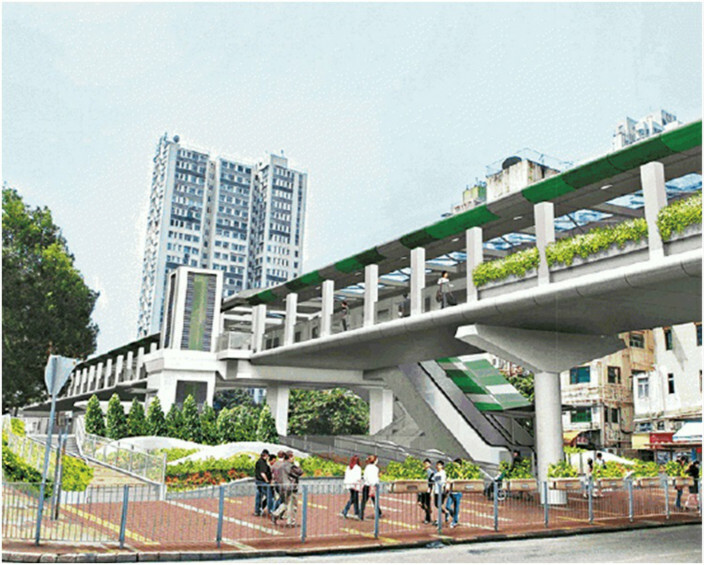 Five professional groups have reiterated their calls for the government to scrap a HK$1.7 billion plan to construct a pedestrian bridge in Yuen Long, and suggested widening roads as an alternative. They are the Hong Kong Institute of Architects, the Institute of Landscape Architects, the Institute of Planners, the Institute of Surveyors and the Institute of Urban Design. Discussion of the project's funding in the Legislative Council was postponed after the groups first voiced their opposition to the plan. The government said it would take the groups' concerns into account, but insisted that it would not scrap the project. At a press conference yesterday, the groups suggested the government use the Lands Resumption Ordinance to resume land for expanding the road. They attributed the narrow footpath, near Tai Tong Road Light Rail Stop and Hong Lok Road, to the congestion problem since its width is less than two meters. Marvin Chen, president of the Hong Kong Institute of Architects, said: "Some old buildings really affect the congestion problem in the district. Can the government consider using the Lands Resumption Ordinance to resume those old buildings to expand the road?" The groups also said there is a footbridge across On Ning Road and Castle Peak Road, which is near the proposed site for the pedestrian bridge. They also referred to Causeway Bay, where pedestrian flow is double that of Yuen Long town center. With people avoiding the footbridges due to places like banks and shops being near the road, the government expanded the crossing area. The groups said the situation on Yuen Long Main Road is similar. People won't have an incentive to cross the road via a footbridge 100 meters away. They also called for the implementation of short-term traffic improvement measures, which include relocating the crossings. The groups added that building the proposed bridge goes against the principle of creating a livable city.